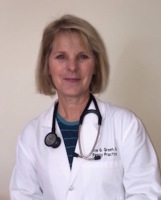 Bonnie Green MD, board certified Family Medicine, has been practicing for 22 years. Trained at the University of Florida - her speciality is family medicine with an interest in urgent care, obesity and wellness. Dr. Green is licensed to practice telehealth in Florida, North Carolina and Michigan. Telemedicine is an innovative way for the busy patient to see a physician through their phone, laptop or desk top computer. Using a secure platform, Dr. Green can treat, prescribe , write a work or school excuse and send you a copy of your telehealth clinic note for your files. Flu, sinus, urinary tract infection, rash are just a few of the illness that can be treated via telemedicine. Adults and children seen. Set up your account with a username and password. You can connect with Dr.Green right then or make an appointmet to connect with her. Telemedicine is a ​​​​​​​​​ fast, efficent and inexpensive way to see a physician for your urgent care needs. We can not prescibe controlled medication, pain meds, ED meds, ADD meds or muscle relaxants via telahealth. It is the law!